Hello Visio Fans! 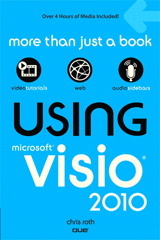 I received a Visio Partner e-mail a few days ago that contains a fabulous set of links to Visio How-To demo videos. 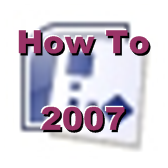 The demos cover new Visio 2007 topics such as DataGraphics, Themes, AutoConnect, PivotDiagrams and Vista integration. Here are the links to the videos. I hope you find them helpful! Where is the “How To” for visualizing a datacenter? How to take a data source which includes the racks & nodes and display the data using the column for stencil/shape and u location in the rack programatically? Good stuff Visguy, its good to get these helper tutorial things together. Visio often proves a helpful tool, but not having sat down and learnt it properly, just picking it up for a quick diagram, it is good to have these helpful videos to get you started. I’m used to being able to grab the background and drag with the mouse cursor to re-position the page view. This is true of Photoshop for example when you press and hold the space bar, click the mouse, and drag around. It is also sometimes called the “Hand” cursor. MindJet MindManager also has it. Does something like this exist in Visio 2007? All I can find is the Pan ‘n Zoom window. Photoshop has that too, but it’s just not enough. I’ll be surprised if this vital feature is missing. It’s not obvious, but Ctrl + Shift + right-mouse-drag is your space bar in the Visio-world! Thanks for the tip.. though Ctrl + Shift + right-mouse-drag is awfully cumbersome! Wonder why they couldn’t go with the standard Shift + left-mouse-drag; pressing Shift doesn’t do anything anyway. I suppose pressing space blanks out the text if a shape containing text is selected while Ctrl + Shift + right-mouse-drag can be used without such effect. While I generally like and memorize keyboard shortcuts, the pan and zoom window seems easier to use than this chord. However, assigning scroll wheel to the zoom has been very handy! I have put together a large org chart with nearly 300 employess for the VP and wondering if Visio has capabilities to perform headcount when a color has changed. It is becoming cumbersome to count each shape manually when updating headcount. IE, VP has 16 Directors under him. There are 5 worksheet that list each director that has has btw 30-90 employees on each worksheet. Any open position is designated by a yellow color, when I update that color with a name, I change that color to match the department. Can a formula be written to update the primary shape on each worksheet when a color changes? Any help is appreciated.